O divine Holy Spirit, eternal love of the Father and of Son, I adore You. I thank You, I love You, and I ask You pardon for all the times I have grieved You in myself and in my neighbour. Descend with many graces during the Holy ordination of bishops and priests, during the consecration of men and women religious, during the reception of confirmation by all the faithful; be light, sanctity and zeal. To You, O Spirit of truth, I consecrate my mind, imagination and memory; enlighten me. May I know Jesus Christ our Master and understand his gospel and the teaching of the Church, Increase in me the gifts of wisdom knowledge, understanding and counsel. To You, O sanctifying Spirit, I consecrate my will. Guide me to do your will, sustain me in the observance of the commandments, in the fulfillment of my duties, and Grant me the gifts of fortitude and holy fear of God. To You, O life-giving Spirit, I consecrate my heart Guard and increase the divine life in me. Grant me the gift of piety. Amen. Eternal Father, I believe in your infinite wisdom and love. I believe that you have created me for heaven, that you have traced for me the way with all the necessary graces to arrive at it, and that there you await me for the eternal reward of a faithful servant. I beseech you, through the merits of Jesus my divine Master, and through Mary queen of apostles, enlighten my mind and strengthen me that I may clearly see this way and generously tread along this path. I am the mother of fair love, and of fear, and of knowledge, and of holy hope. In me is all grace of the way and of the truth; in me is all hope of life and of virtue. Come to me all that desire me and be filled with my fruits (Sirach 24:24-26). 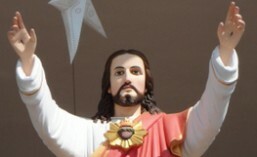 The Litany of the Sacred Heart gives us many striking images of our Lord and His love for us. Christ’s heart is a “burning furnace of charity” “bruised for our iniquities” and yet still the source of “our life and resurrection” if we love and follow Him as best we can in our daily lives. The Litany of the Sacred Heart of Jesus is a moving way to express devotion to Our Lord by making reparation through adoration for the offenses committed against His Sacred Heart. God the Father of heaven. the praise and satisfaction, which he has offered You in the name of sinners.